Tonight, my wife Valorie and I went to our friend Amy’s 50th birthday party at a club in Sherman Oaks. Because our lives have been intersecting for more than 15 years, Amy and her husband Ross and Valorie and I have a lot of friends in common. Still, there were some people there I didn’t know. One guy, Bill, asked how I knew Amy and Ross, and I explained that Amy is my business partner. I’ve also done a lot of theatre with Ross, who is a fine actor and director, but I didn’t go into that because the club was loud and it was a chore to have a conversation. “I don’t know. Something with three people,” he said. I didn’t tell Bill that I too had seen that play. We’ve all heard the bad news. Occasionally, I like to share some good news here in a vain attempt to balance it out. Here goes. Last month, the California Department of Motor Vehicles fined almost 500 not-disabled people for using parking placards reserved for disabled people. Those who were caught had their disabled parking placards taken away and now face fines ranging from $250 to $1,000. This makes me absolutely delighted. My late brother-in-law was in a wheelchair his entire life, my mother now occasionally uses one, my brother is fighting Parkinson’s and has difficulty walking, and I have several friends in wheelchairs. That’s who those placards — and parking spaces! — are reserved for. They’re not meant for people who just want to park a little closer while they run in to buy coffee — they’re meant for people who face real challenges getting into and out of vehicles and need to park closer and in wider spaces. I wish the DMV great success in finding and fining even more of these thieves. On a personal note, my new play is moving along nicely. I knew you were wondering. Plus, my back is, well, back to fully functioning. Earlier this week, the great band Devo was nominated to the Rock and Roll Hall of Fame. While this is not as momentous as if the even more revolutionary and distinctive band Pere Ubu had been nominated, this is still well-deserved, and I rejoice in their nomination. Their rendition of “(I Can’t Get No) Satisfaction” remains the superior version, far outclassing the first version, by those Rolling fellows. I hope they get inducted and only wish that Bob 2 had lived to see it, but I’m glad I got to see him and the rest of the band while he was still around. Incredibly, another band high on my list was nominated at the same time. I have every Roxy Music album and listen to them endlessly. Ditto for Bryan Ferry’s solo disks — every one of them, except that one where he covered his own songs in a precious 1920’s style (no thanks); I’ve also got five or eight of Brian Eno’s albums and one of Phil Manzanera’s. The later Roxy Music albums are filled with beautiful yearning; the early Roxy Music albums are raucous and twisted, stuffed with songs that started fake dance crazes, proselytized the delights of anonymous post-midnight pickups, and pledged love to a blow-up doll. When you can deliver an anthem built around lyrics like “Plain wrapper baby, your skin is like vinyl … deluxe and delightful, inflatable doll,” you deserve to be in a hall of fame. So: There. It’s not all bad in the world. I wanted to get one last post in for September before ringing out the month, so this is that post. I’ve been doing a lot of writing, just not a lot of posting. Sometimes — frequently? generally? — I can do both. But lately I’ve been trying to finish a draft of my new full-length play, a play that I have been working on off-and-on for years, and what has helped me make real progress has been staying in the universe of that play. That means: restricting my writing to being writing about that play. About those characters. About their overall situation. Even when I’m writing scenes and bits and pieces that I suspect won’t wind up in the play. So, in addition to the play itself, I’ve got a notebook full of scenes, and monologues, and notes, and other bits… and I think they’re adding up to something. For most of my writing life, I’ve written more than one thing at the same time. Sometimes, I’m writing three plays at the same time. I’ve written my share of short stories, a couple of abandoned novels, dozens of terrible poems, innumerable essays and book reviews and blog posts and what-have-you, as well as about sixty plays of varying length and plenty of folderol and also lots and lots of advertising and marketing copy. I’m always writing something. So it’s been strange to restrict myself, as much as possible, to this play, but it’s a play I’ve wanted to finish for a while and I decided to make this change. And I found another version of the play, from earlier in the week, in that same directory. And when I opened that version, I found that in that one, I had indeed fixed that character, and straightened out the arc of the play — and also had written eight new pages that now weren’t in this new draft. Which also had five pages of new copy. So, in other words, somehow… I have been working on this play in two different drafts. Updating them both. Adding to them both. Am I busy? Sure. Distracted sometimes? You bet. But I don’t think I have Alzheimer’s. After that discovery, which as you can imagine was not a happy one, I spent further hours straightening all of that out, at least preliminarily, so I could send the pages to my director friend. When you find you’ve got two separate suits you’re tailoring and then realize that really they should be one unified piece, it takes some ripping and tearing and redesign to make that work. My goal is to finish a good strong draft of this play by the end of this year, and then have a reading in January. I should be able to do that, so long as I don’t start working on a third version of it. In the meantime, now that I’ve written all of that other stuff going on in it, I should feel more secure in that universe, and able to post here more frequently. Two Saturday nights ago, we celebrated the 25th anniversary of the opening of Moving Arts. But, actually, it’s tonight that’s the 25th anniversary. I won’t go into our history again — I did that five years ago on that earlier commemoration; you can read that history here — but I do have to note a few changes, and one constant. Tom Boyle, who was a big part of that founding, and of many years of my life, died a couple of years ago. I miss him and think about him most days. I’d love to talk to him about the current political situation, or the recent crop of movies or TV, or just play a game or share a drink, and I do try to imagine how those conversations would sound, but my imagination is a poor substitute for Tom himself. Because he was smart and funny and loyal, he was everything I look for in a friend. I’m glad I got to spend as much time with him as I did before he finally pierced the veil and stepped into the beyond. I will say that his death has made me appreciate my still-living friends even more. Since that post of five years ago, we’ve gained some new board members who have done a lot to move the organization forward. We’ve actually got cash in the bank. (Which should in no way deter you from making an end-of-year contribution — we’ll always need more, and cheerfully accept it!) At times in the past, the cash in the bank was about five bucks. Now, in 2017, we’ve got more than five bucks. Significantly more. It’s not a buying-a-house-in-Los-Angeles amount of money — nowhere near — but it’s not five bucks. That’s saying a lot for a small-theatre company in Los Angeles. Probably a year (maybe two?) after I wrote that 20th anniversary post, we were incredibly fortunate to land a new artistic director, Darin Anthony. He’s a talented director and a visionary leader and it’s my pleasure to do what I can to support him. Everybody else on the board feels the same way. He wants to do big things, and he’s inspiring the rest of us to help him. Twenty-five years later, we’re still doing new plays. Sometimes I ask myself if I ever envisioned, in 1992, that we’d still be here in 2017. I don’t know. I do remember wondering in February of 1993 if we’d be there in March of 1993. That was tough — and there have been many, many other financially tough times — but we’ve gotten through them all, and in some ways we’re doing better now than ever. And we’ve got big plans for the future. It’s an exciting time for Moving Arts. Was it five years ago, on our 20th anniversary, that Steve Lozier and some others produced an event at the Silent Movie Theatre on Fairfax that featured celebrities doing roles from our first production? I can’t remember any more. But I do remember what we did two Saturdays ago: We held a big house party in the Hollywood Hills that featured five short plays fully staged at different locations within that house. They were all new plays; the venue was packed (our biggest turnout ever for that event); and there were so many people having such a great time, myself included, that I actually sent out to get more alcohol delivered from the local liquor store. All of the plays were fun, and so was the event. At some point, I repaired outside up on the hillside terrace behind the house to share Cuban cigars with two other playwrights and have drinks and just talk. That cemented the evening for me: new plays, great fun, and camaraderie among smart creative people. That’s what we’ve been doing for 25 years: birthing new plays, and bringing smart creative people together. Every day you get to do that sort of thing is a celebration. Last Sunday night, this playwright had one of the best nights he’s ever had in the theatre. And I’ve had lots of great nights in the theatre, starting 40 years ago. My play, “Triptych,” which was running as part of the Hollywood Fringe, closed — but it closed to a packed house, tumultuous laughter in all the right places, and to this review. My only regret was that the play had gone unreviewed. But then, as I mentioned above, I discovered today that the production got this review. The critic, Ernest Kearney, is a playwright, and a good one. The added benefit of having a good playwright review your play is the informed insights he might bring; in this case, Ernest is very smart about my play. He’s seen earlier work of mine; he’s right that I’m misleading the audience intentionally; he’s right that I’m “burying” the lead. I’ve had good reviews and bad reviews and dumb reviews. The best ones are the smart ones. Today in my playwriting workshop, someone asked me what was next for “Triptych.” I don’t know at the moment. I may send it out to developmental workshops. But at the moment, I’m writing another, entirely different, play. My new play, “Triptych,” opened today. It runs through June in Hollywood at the Stephanie Feury Theatre. Here’s where to learn more, and get tickets. Here are some initial responses. And it does. It reeks of me. The wordplay, the insistence on grammar, the vocabulary, some of the tensions in the relationships, the mockery of Barefoot wine, and much more. “I’ve heard you say a lot of that!” he said later. We stopped at the supermarket later to pick up a few things, and he went on about how much he heard “me” through the play. I told him that I’ve written lots of plays, and lots of different sorts of plays, and that not all of them sound that much like me. I told him that I’ve written a lot of blue-collar characters with restricted vocabulary, and reminded him that I grew up knowing a lot of people like that and that I have great respect for them. But he hasn’t seen those plays — and I had thought he hadn’t seen any other of my plays, until I remembered he’d seen a couple of short plays of mine the past couple of years at the annual Moving Arts holiday party. My producer asked me to write a note for the program, and I told him I’d get it to him Tuesday. Which means that at 10 p.m. yesterday (Tuesday), I was writing it. On the face of it, the assignment was simple: 200-250 words, from the playwright, for the play program. And, hey, I’ve written many program notes, introductory comments, introductions, prefaces, etc., over the years. I wouldn’t say I’m an expert on 200-250 words (although I did pretty well within that limitation for a few years for the LA Times holiday book section, back when there was a holiday book section), but I do well enough. Just in the past month, I’ve written three of these things for three different publications. You don’t want to give away the plot, because that cheats the audience of the experience. You don’t want to say what the play is “about,” because that also cheats the audience of the experience. It relieves them of the responsibility of thinking about it. Plus, why have the play at all if you’re going to have a note that explains it in just 200-250 words? You don’t want to discuss your inspiration, because it misdirects your audience — now they’re thinking about you, rather than the play. So, in general, it’s just better not to have a program note. But I do try to play along, to be a good sport, to be a soldier for the production. After all, the actors and the director and the designers and the crew and everyone else have put in a lot of effort — while you’ve mostly sat at home. So, when asked, I write them. Here’s what I wrote for this one, and I assure you, it has almost nothing to do with the play. What I hope it does do is to say that even the things we think we know are open to interpretation. As a young man thirty-five years ago, mustering what little money I had, I bought a very pricey print of “The Garden of Earthly Delights” by Hieronymus Bosch from the Philadelphia Museum of Art and had it very expensively framed, and since then it has hung in every apartment or house where I’ve lived, and where I can look at it every day I’m home. The leftmost panel depicts Jesus, Adam and Eve in Eden. The central panel is filled with people, all of them naked, cavorting with each other against the backdrop of a lush, full paradise. The final panel shows us an awful tableau of sinners being tortured in the most imaginative ways in Hell. For a painting that seems so straightforward, it contains diabolical levels of mystery. Do the sins of the middle panel lead to the perdition of the third? Or is the middle the ideal state, a Paradise lost, that we are doomed to regret if we cannot attain it? Those, and many other theories about the painting, abound. I don’t expect to get a definitive explanation – about this, or about many things. But thinking about this, and the many other things, fills me with wonder – about people, and about their unrevealed inner workings. I hope that says just enough, and not more. Without risking becoming one of those tiresome people who recounts how busy he’s been by providing a litany of tasks and appointments, let’s just confirm the assumption that there’s been a lot going on. Among other things, I’ve given a number of talks in California that I hope to be writing about here soon. (We’ll see.) And in addition to doing a lot of speaking, I’ve been doing a lot of (non-blog) writing. I’ll be in New Jersey and New York May 4 – May 10, so I’m hoping to catch up with some friends and colleagues. May 10 – May 12, I’ll be in Lake Tahoe on business. May 18 – 21, I’ll be in bucolic Hays, Kansas for my good friend James Smith’s long-overdue wedding to a delightful and beautiful woman who will actually have him. James has been in more of my plays than any other actor (eight of them? 10? ), and now he’ll be acting the role of a responsible grown-up. I’ve never been to Hays, Kansas or, I think Kansas itself. A good friend who is also a very good playwright, Ross Tedford Kendall, is also from Kansas, and when I told him I’d be visiting Hays, he just laughed long and hard. That caught my attention. But hey, where I’m from isn’t exactly a metropolis either. 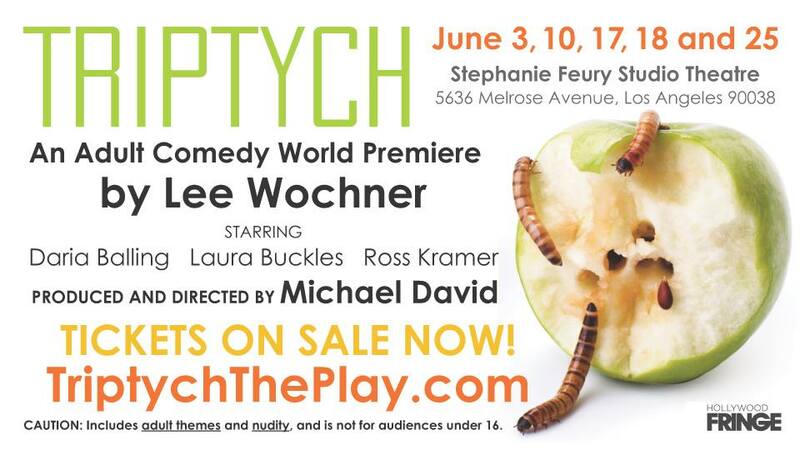 On June 3, my new play “Triptych” will be opening in the Hollywood Fringe Festival. More to come about that. (Including a link to secure tickets.) The play went through several different working titles, including “Pyramid,” “Triangle,” “Triptych” and “How We Know You,” before my director convinced me to call it “Triptych.” I would say I’m hoping for the best, as one always does with a production, but I’m blessed with three honest-to-God great actors, all of whom I’ve worked with before, and a talented director who understands my work and my sensibility. If you’re in LA in June, I hope you’ll come see it. While in the past I’ve been happy to celebrate Washington’s birthday, or Lincoln’s birthday, I’ve never wanted to celebrate President’s Day, for the simple reason that I don’t celebrate all of them. I didn’t like it when George W. Bush was the president, I don’t recall liking it before that, and I certainly don’t like it now. In addition to not-celebrating the holiday, another reason I had a hard time just a minute ago remembering that it’s Monday and not Sunday is that I spent the morning eating a leisurely breakfast with strong coffee, horsing around on my iPhone playing far too many rounds of Drop7, and making mental lists of things I should do today but probably won’t. In other words: Sunday activities. I was especially confused when the newspaper was even slimmer than usual — pretty slim for a Sunday! … Oh. Yesterday, on what felt like Saturday but was actually Sunday, I took my daughter to LACMA to see the exhibit of German art of the Renaissance. My forebears were torn between two factions (in this case, the Catholics and the Protestants), an awful conflict that gave rise to some great art and some very snotty illustrations that reminded me of the underground comix o the 1960s. (Good thing nothing like this is happening these days.) The work was deeply beautiful and generally disturbing — very warlike, with representations of the chosen arbiters (Martin Luther or the Pope) swinging between deific and demonic, and with much heraldry, spilled blood, and tortured Christs. The portraiture of the one-percenters (who, of course, could afford portraits of themselves), was necessarily flattering. Hats off, then, to Albrecht Durer, who had the audacity to depict one such Burgermeister as a thin-lipped, cold-eyed coot. I can only wonder what this person thought of his portrait. While we were there, we paid extra to see the exhibit showcasing the work of Diego Rivera and Pablo Picasso. I’d never thought of the two together, associating the former with a sort of socialist-peasant art and the latter with modernism, and I wasn’t aware of their friendship, but now I’ve been educated. I was especially interested to see how informed Rivera’s work was by Mayan art, with its simple uninflected portrayals of people, and also to see Picasso’s elementary illustrations of a translation of Ovid; it’s astounding how much he could convey with just a simple fluid line. Go to the gym. Do the grocery shopping. Write as much as possible. That’s my to-do list for today. You are currently browsing the archives for the Playwriting category.